These little pots of heaven were devoured in no time (I halved the recipe below)– the addition of raspberries made them extra special. Preheat the oven to 320°F/160°C. Have ready six 200ml capacity ramekins and a large roasting pan. Boil some water for the water bath. Divide the raspberries among the ramekins (6 per ramekin). Bring the heavy cream and zest to a boil over medium heat in a medium saucepan. Remove from the heat, cover and let stand for 10 minutes. In a medium bowl, whisk together the egg yolks, 1/3 cup of the sugar and the salt. Add ½ cup of the hot cream mixture, whisking to avoid cooking the eggs. Pour in the remaining cream mixture, whisking constantly. Stir in the lemon juice. Pour the custard through a strainer into a large jar. Skim any foam from the top of the mixture. Divide the mixture evenly among the ramekins, topping the berries. Place the dishes in the roasting pan, then place the pan in the oven. Pour enough boiling water into the pan to come halfway up the sides of the ramekins. Bake for 25-30 minutes or until the custard is just set around the edges and still jiggly in the center. Do not overbake. Remove the pan from the oven and let the custard stand in the water bath for 10 minutes. carefully and using thongs or a wide spatula, remove the ramekins from the water and set aside to cool to room temperature, then refrigerate, loosely covered, for at least 3 hours or up to 2 days. Divide the remaining 3 tablespoons of sugar equally over the tops of the custards then caramelize it with a blow torch. Beautiful. Never made creme brulee before although I really do like the dessert. Great pictures. By the way I really like your blog, great work! Oh, good! Ted bought us a blow torch for Christmas and I have yet to use it. This is the recipe we'll try first. So pretty and elegant creme brulee.. So sweet and springy! Nice for an Easter dessert! I never thought about putting fruit in creme burlee it looks really good! These look great! I just came across your blog.. loving it! Lovely recipe! Your creme brulee looks absolutely perfect. Mmmm! Miryam, thank you! You are far too kind! Lydia, I hope you give it a try! Nina, thank you, sweetie! I am sure you will love this dessert! Abby, thank you! Great idea! Emily, not true! Your desserts and baked goods are always wonderful, sweetie! Yum, these look amazing. You can't beat lemon and raspberry! I'm usually anti-any kind of creme brulee that's not vanilla bean, but this looks amazing! 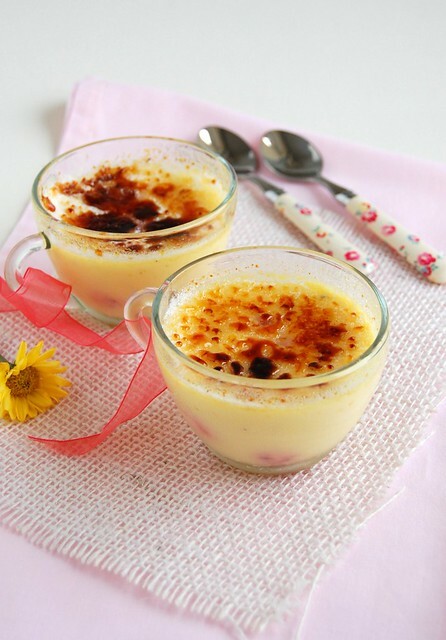 I have a weakness for creme brulee, so I'll definitely be trying out this recipe.